The light-emitting diode (LED), while expensive, offers many benefits over traditional grow lights for your indoor tomatoes. LED lights consume less energy, are high-intensity and do not need to be replaced. In addition to these money-saving benefits, the spectrum of LED lighting can be adjusted according to the growth of your tomatoes. Whether you are simply starting your tomato seeds indoors for future transplant or planning a year-round indoor tomato garden, LED lighting is an eco-friendly lighting alternative. Mix your potting soil with equal parts peat, perlite and vermiculite, and add 1 tsp. of hydrated lime per gallon of soil. This will adjust the pH of the soil and provide the tomatoes with calcium. Pour the soil mixture into your tomato planters and water lightly. Allow the soil to settle and even the surface with a hand-held rake. Plant the tomato seeds 1/4 inch deep with about eight seeds per square inch. Cover the seeds with soil. Mount your LED unit no closer than 12 inches above the soil. Mounting recommendations will vary by manufacturer. Leave your LED on 18 to 24 hours a day. Set the spectrum on your LED to a cool white. Fertilize your tomato plants with a liquid fertilizer diluted to quarter strength once a week. Check the moisture of your soil daily. Because LEDs are cooler than traditional grow lights, you will can space out your watering over longer periods. Thin your tomato plants once they grow to 1 inch tall. Give each tomato plant about 3 inches on all sides. Continue to grow your tomatoes indoors or transplant the plants with their root bundles into an outdoor garden. Place your containers in a sunny location if possible. Tomato plants will benefit from natural sunlight even with an LED unit. 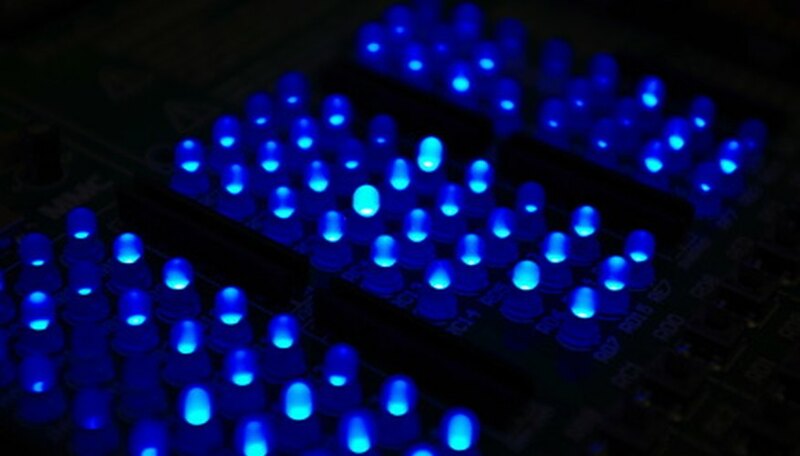 LEDs emit a very high-intensity light. Never look directly into a LED bulb.